Welcome to The Blackson Job where we pair simplicity with elegance. 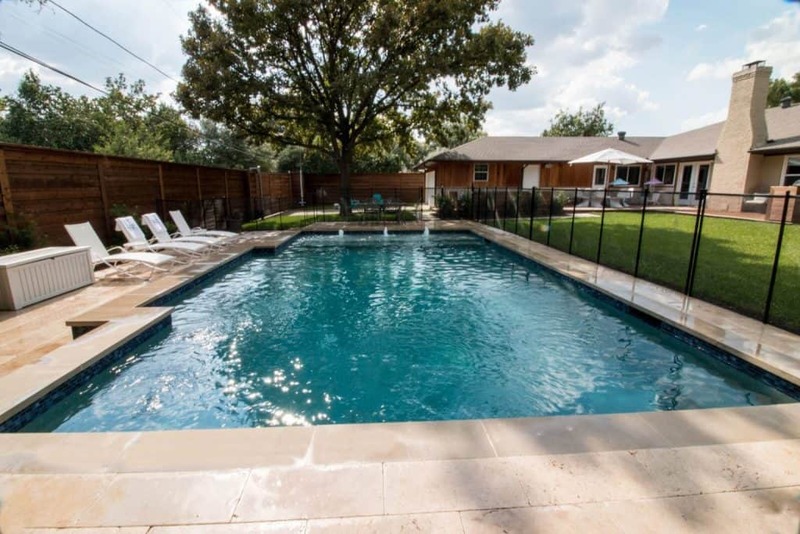 This Dallas swimming pool is a wonderful example of how we can craft a beautiful swimming pool using a simplistic design with high-quality materials and craftsmanship. We credit our amazing superintendent, Dave Jetter, with the design and construction of this backyard. Incredibly, he constructed this space from start to finish in as little as 5 weeks! 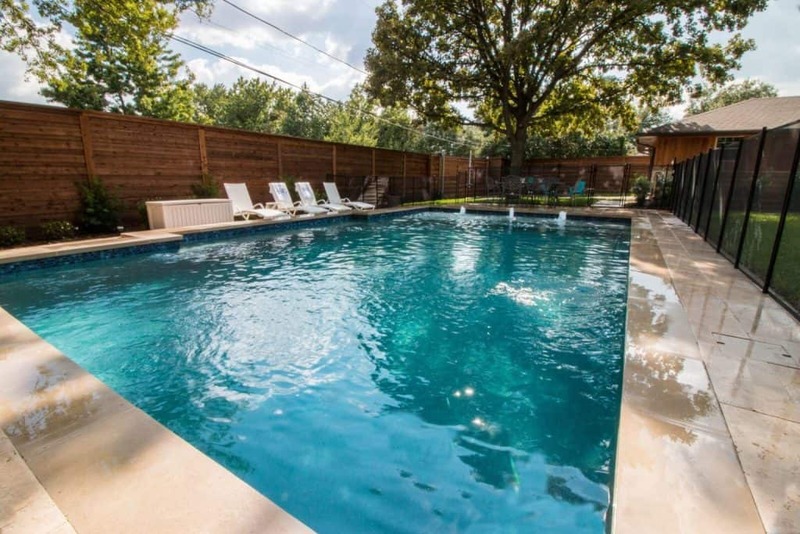 There were lots of beautiful materials and great features selected for this pool and we love sharing this information with you. Now that we’ve covered the intro, let’s dive in! Making your backyard and home safe to your children is always the number one priority. To accomplish this task, we offer a premier safety fence line called Baby-Loc by Loop-Loc. This brand of safety fencing meets all ASTM Safety Standards and comes available in 4’ or 5’ sections. They are also constructed of a mesh material that is difficult for young children to climb and won’t fade or tear over time. The locks are self-closing and can be installed on any section of the fence. Designing this safety fence is easy and can fit any swimming pool shape. These fences are anchored into the deck and can also be removed at any time. This homeowner chose a conservative rectangular shape which fit perfectly in the corner of their backyard. Designing this shape retained over half of the backyard for the children and pets to play. Using the rectangular shape we created a shallow end with a Splash Pad and Bubblers with a Deep End on the other side. In the shallow end, we installed a Splash Pad with three bubblers for aesthetics. Splash Pads are typically 6” to 12” in depth and are excellent spaces for small children to safely swim and play. 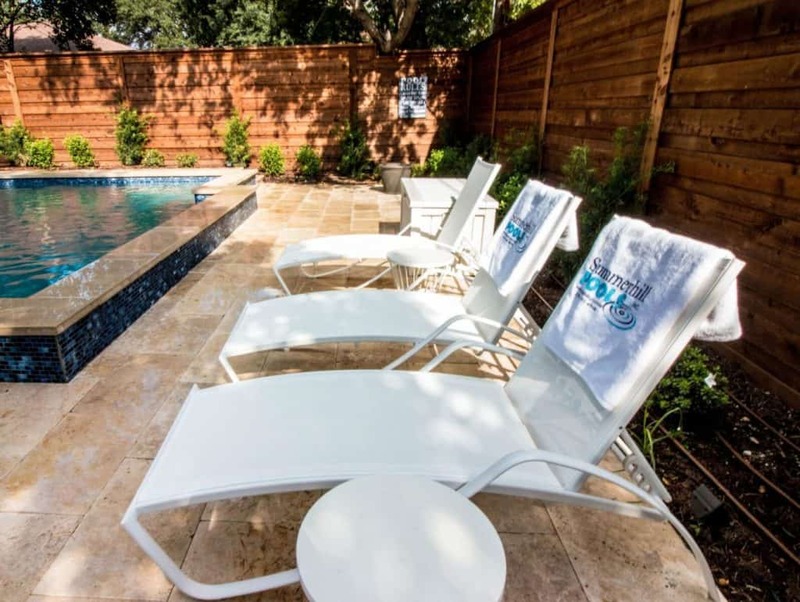 These areas also provide excellent space to escape from the summer heat in the summer heat while catching your summer tan. Bubblers are an excellent add-on for any pool and come available with optional LED Technology for beautiful effects at night. For the decking, we installed Ivory Travertine Pavers by QDI. Travertine is a natural stone mined in the quarries of Turkey. Natural stone really enhances the look of any backyard due to its natural variance in color and shading. The plaster is the material that makes up the walls of your swimming pool and provides a waterproofing barrier. It comes in a wide array of colors and textures. For this pool, we selected River Rok Lucayan by SGM. If you look closely at the images of this pool, you will notice a blue and navy Tile Line pattern along the water line. This is the Essence Royal 1”x2” tile offered by NPT. Quick “Pool School:” Tile is a necessary part in every swimming pool. It provides a waterproof barrier and protects the plaster from drying out from the natural air. Plaster is a delicate material and must be submerged to retain its color and texture. To sum it up tile serves two purposes: protecting the plaster and providing a beautiful design to your swimming pool. Voila! A Beautiful Swimming Pool! Building a beautiful pool is an art form and one that we have been mastering over the past 28 years. 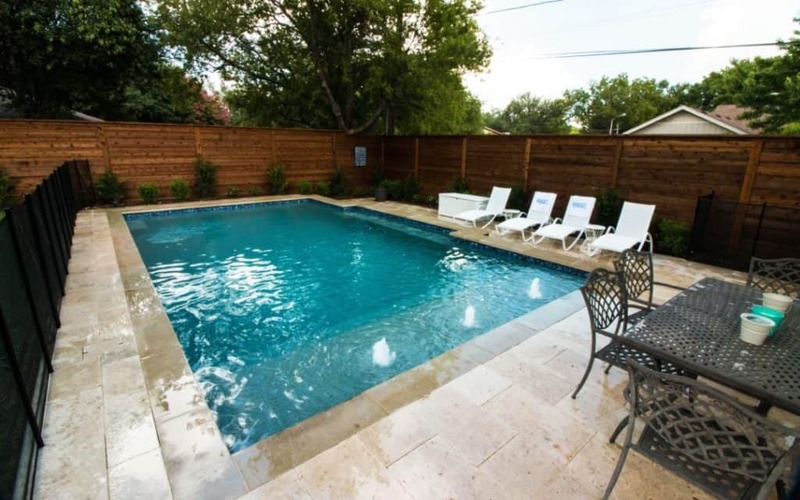 At Summerhill Pools, our top priority is building you a pool that will enhance the look and functionality of your backyard space. We believe that there is a movement taking place in today’s economy. People now want their backyards to be an extension of their homes and we are joining that movement with excitement! If there was something that caught your eye or you know that building a pool is in your future, we invite you to contact us. We love designing these spaces with our customers and would love working with you to bring your backyard space to life! We also have some videos available for you to review to see how we design these spaces using some incredible technology!